In a league filled with talented players, many on their way to the major leagues, it takes something extra to stand out and be named the Cape League’s Robert A. McNeece Outstanding Pro Prospect. Ryan Eades of the Bourne Braves has captured the B.F.C. 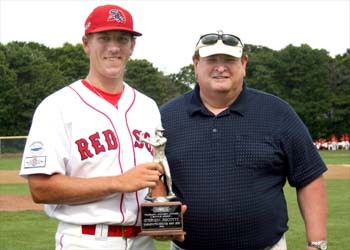 Whitehouse Award as the Cape Cod Baseball League’s top pitcher for the 2011 season. The emotional and mental aspect of baseball is just as important as the physical performance on the field. After winning the Cape Cod Baseball League championship last summer and appearing in three consecutive finals, Cotuit’s deep runs into the playoffs were halted before they even had a chance to defend their title. Mark Appel, YD Red Sox RHP and John Wooten Harwich Mariners IF selected Pitcher and Player of Week # 9. Playoff schedule of games and locations. The Cape League honored Ashley Crosby for her many contributions working within all facets of public relations. It was a dog fight we expected and a dog fight that we got. Steve Piscotty (Stanford) didn’t learn he had joined the likes of Lance Berkman, Jason Varitek, Paul O’Neill and Thurman Munson in the pantheon of the Cape Cod Baseball League’s batting champions until nearly one hour after the final regular-season game. The cape League is pleased to announce WEEI Cape Cod (96.3 FM) will broadcast the 7 pm CCBL playoff game between Falmouth and Wareham on Thursday night. The Cotuit Kettleers stumbled into the playoffs last summer on a six-game losing streak. But they never looked back after entering the tournament, making it all the way to the championship series against the Yarmouth-Dennis Red Sox. Jack Marder (Oregon) capitalized on his chance with the Falmouth Commodores, and recently signed with the Seattle Mariners as a 16th round pick. Win or lose, there is still a player who stands out for each side of the field at the annual Cape Cod Baseball League All-Star game. For the losing West division, the Most Valuable Player was awarded to Wareham’s sophomore right-hand pitcher Konner Wade (Arizona, 1-1, 1.53 ERA).